April 11, 2019 — USPS celebrated the beloved murals that bring a touch of beauty to Post Offices across the nation at its latest stamp dedication ceremony this week. 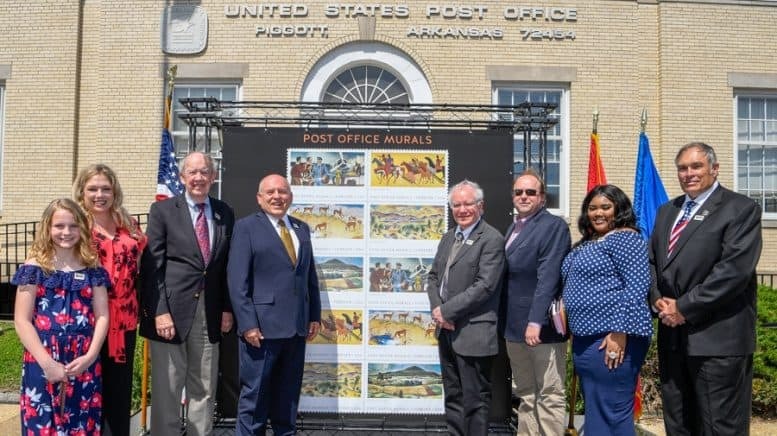 Post Office Murals, a pane of 10 stamps that showcase five classic murals, was dedicated April 10 at the Piggott, AR, Post Office, home to one of the featured works of art. The Post Office Murals stamps showcase five murals: “Kiowas Moving Camp” in Anadarko, OK; “Mountains and Yucca” in Deming, NM; “Antelope” in Florence, CO; “Sugarloaf Mountain” in Rockville, MD; and “Air Mail” in Piggott.